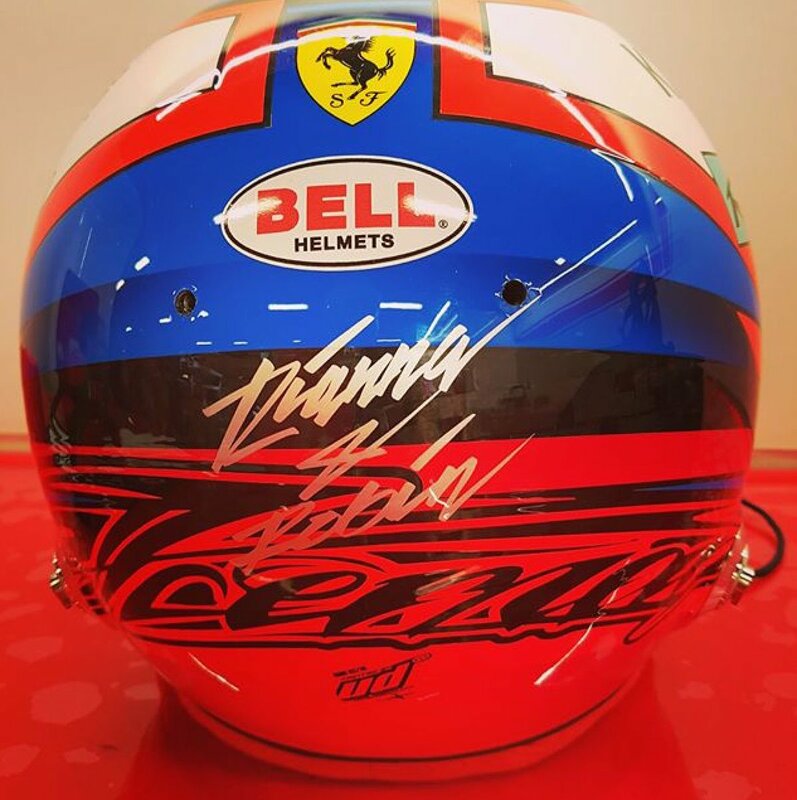 Kimi Matias Raikkonen has always carried a distinctive helmet theme or design since he began competing in Formula Renault and through Formula One. The tribal marking is commonly used effectively as his brand logo on his website and marketing campaigns. 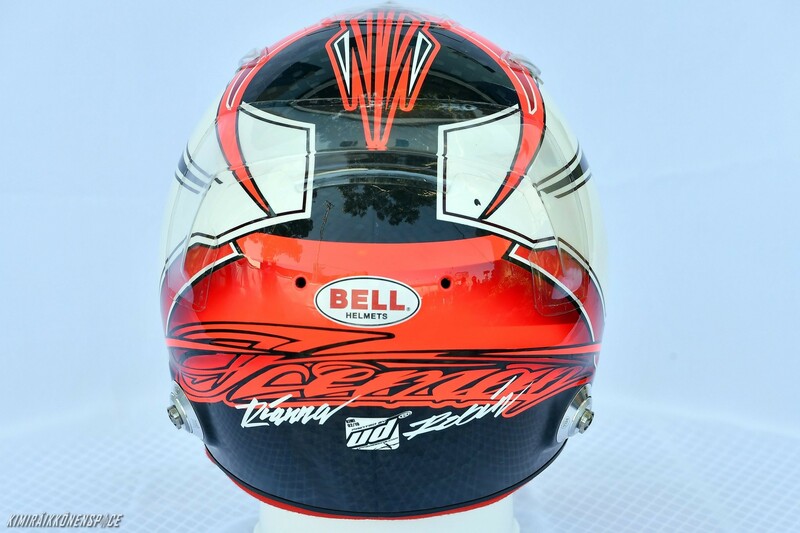 Kimi’s helmet has created a huge craze in India in particular, with replicas of his design used by motorcyclists in the busy capitals especially. You will also see it used as the logo of his motor racing Formula 3 team Double R Racing, co-founded with manager Steve Robertson. 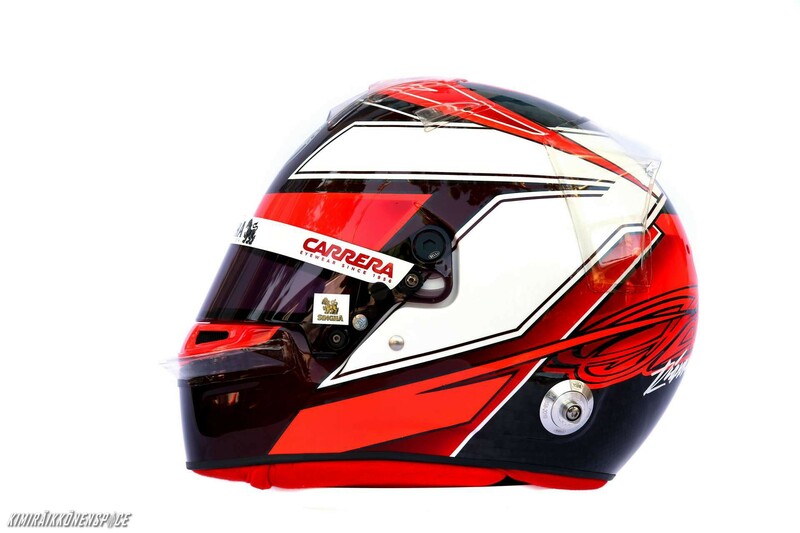 Räikkönen’s helmet, designed by UffeDesigns (Uffe Tagstrom), manufactured by Arai (2001-2006,2012), Schuberth (2007-2009), Bell (2013-2015), almost never changed from team to team letting only some elements like the insignia on top evolve. The insignia was painted in white during his time racing for Sauber and Mclaren until 2005, and red from 2006 with McLaren and during his time with Ferrari. His helmet has also always featured a V design running on the circle top -representing a bird flying – and the inscription “Iceman”). In his debut race, his helmet was predominantly blue with white and silver details. When he joined McLaren in 2002 the design was left intact, only making the top circle all blue (rather than blue and silver) and with some black details on the chin area. In 2003–2005 his helmet was blue and white with some red and silver parts, red details were added on the rune symbol that was added to the M design. In 2006 his helmet was the same, only changing the blue to black with red and white lines on it. When racing for Ferrari Raikkonen’s helmet changed radically: it was white with the middle part black and red with tribals and a black circle with the rune design in the top, in 2008 black paisley motifs were added in the red areas. He retained this design in some rallies, although the helmet style was significantly different for this discipline. In WRC and NASCAR he used a blue Stilo helmet with Red Bull’s logo, silver and white accents (to resemble Red Bull’s can design and Raikkonen’s Sauber helmet lines), the rune symbol and the M insignia (in white and red) and with the inscription “Iceman”. In his return to Formula 1, he sported a black helmet with a white diagonal line crossing from each side until the angles of the visor and a thicker red diagonal line beneath the white line and a red number 9 in a corner of the white line (to allude to his car number), a white circle in the top with black edged designs (similar to horns) on the upper front. the algiz rune in the top became black and in the back of the helmet there is the inscription “Iceman” written in red letters. From the Australian Grand Prix, there are more details added on top of the helmet. Manufacturer of his helmet for 2012 is Arai. For 2013, Bell announced that Kimi has joined them and is using their helmets. 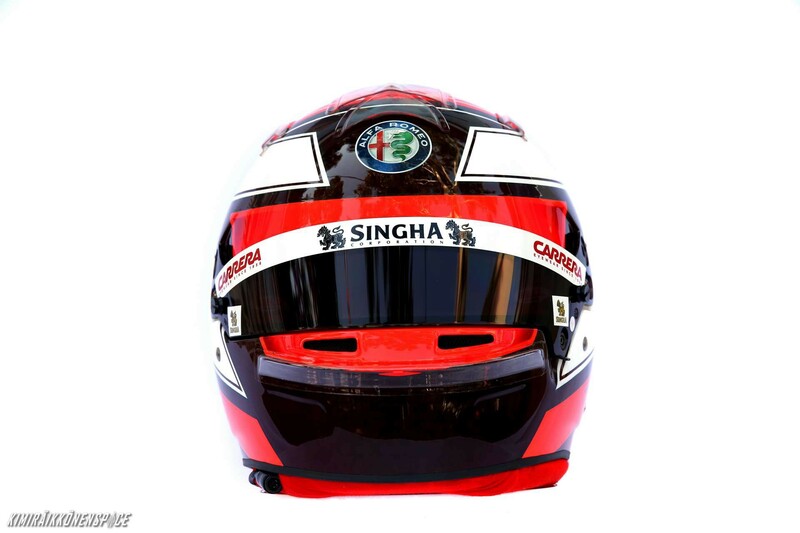 The 2013 helmet has a similar design approach to 2012’s, with his driver number (7) on the side in a more prominent position, his Iceman logo on the rear but in white opposed to black on the front. In the final pre-season test at Barcelona, Kimi adopted a rear spoiler/winglet onto the Bell helmet, with also slight livery modifications on top. The CEO in Bell’s Asian and African actitivities, Martine Kindt, praised Räikkönen’s significance to their Bell-company to Turun Sanomat. “We have worked together with stars like Senna, Prost, Berger, Fittipaldi, Schumacher, Button and Villeneuve. They were all very special drivers, but we have Kimi here and now. He is very important to us, he is a world champion and he believes in us and we want to thank him by doing our very best for him. Hopefully this leads to new victories and a championship,” Kindt emphasizes. A switch from one camp to another wasn’t really in Räikkönen’s plans after last season. “Kimi felt that the relationship with the earlier helmet company was good and he wasn’t especially interested in us. It took it’s time before he decided to check out what we have to offer. In December he told us that he wants to try our helmet. “For us it was clear that he wouldn’t commit into anything unless he would be immediately completely satisfied with the feeling that our helmet gives him. We knew that we had to assure him the best way possible in a very short time. Kimi knows exactly what he wants, he is very accurate and technically he is very sharp. He sets his own quality requirements and it was up to us to meet them in order for him to be satisfied. “You can’t do any small-talk with Kimi, everything has to be clear and concrete,” Kindt reminds. The new superhelmet is completely custom made to fit Räikkönen’s head. “We started the work by taking a three-dimensional X-ray of his skull. This way we could shape the helmet to fit his head in the best way and thoroughly optimize the comfort of usage according to FIA:s latest regulations,” Kindt explains. 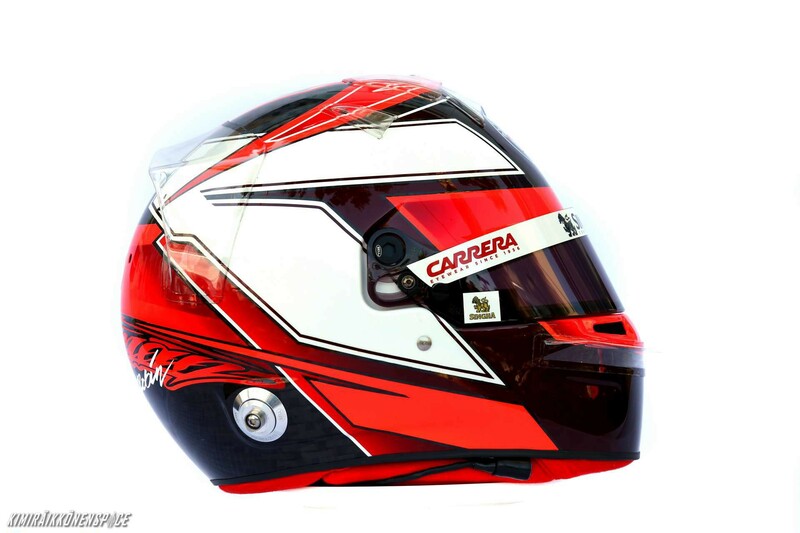 “Because of the G-powers the helmet’s weight is extremely important for the F1-drivers. This is why we aim to lessen the weight on a regular basis – especially because of the new regulations from FIA. It’s not simple, it takes a lot of research and funding to research new materials and new production methods,” Kindt clarifies. A year ago Bell celebrated together with Pastor Maldonado his GP-victory in Barcelona, this season they got immediately a bull’s eye in the opening race in Australia when Räikkönen hit the jackpot. “Kimi’s victory meant something very special and big to us. Since our co-operation started in such an awesome way it was a very emotional moment for us. Everyone had worked so hard for it – Kimi, our engineers – and his helmet painter Uffe Tägtström,” Kindt glows. 2014 – BACK TO SCHUBERTH OR STICKING WITH BELL? Ferrari have Schuberth as their official helmet partner in F1 and Kimi’s previous Ferrari helmets were all by Schuberth. At the Ferrari launch, Kimi used the Schuberth helmet for the official press images. Later during winter testing in February, Kimi reverted to Bell. For press images, it seems that the Scuberth helmets are used as they are an official partner/sponsor of the Ferrari F1 team. However, Kimi reverted back to Bell for driving purposes. For 2014, all F1 drivers were required to have their newly chosen career number displayed on their helmets. Kimi chose number 7, portrayed in yellow (colour of Shell’s logo) on both sides in a symmetrical fashion. Kimi’s helmet is predominetly a luminous red that looks orange from the front and has introduced a different colour to his previous helmets – a yellow lining. The Iceman logo is remains across the back in yellow over a black strip that leads to the top insignia. In 2015, Kimi debuted his helmet during the Jerez tests in February, sticking with Bell as the manufacturer. It has some contrasts to his previous Ferrari helmets and some may think of his 2005 Monaco and 2006 McLaren designs with the main colours being red, black/grey and white. We see a more prominent black skid lid and bottom base, starkly contrasted against white. The number 7 is a luminiscent red colour and is designed more anonymously than the previous year. Unlike 2014, it is completely free from yellow. It blends into the back of the helmet, which is grey and has the Iceman logo spread across in red like during 2012 at Lotus. The Iceman insignia on top is more intricately evolved in grey and red. Kimi is now a doting father who chose a sweet tribute to his two children Robin and Rianna by having their names placed above his Iceman graphic for the 2018 season. After the 2018 F1 season had ended, Kimi was granted permission to take part in the Pirelli tyre test in Abu Dhabi for Sauber whom he will be driving for during the next two seasons. He appeared at the test in plain white overalls free of any sponsorship and likewise was his helmet; similar to his current design but a muted mono-tone version. 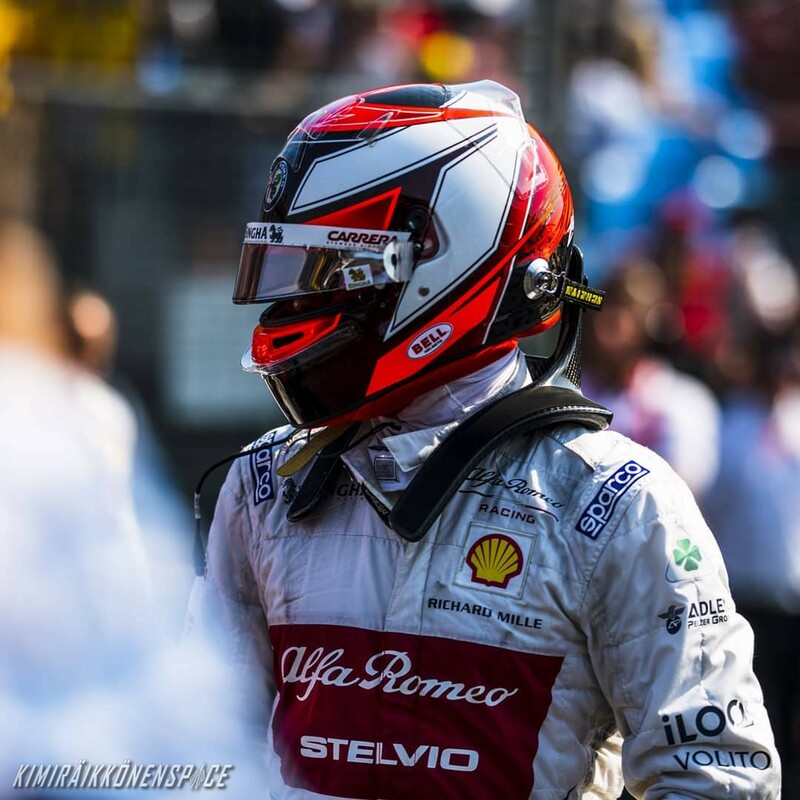 During the 2019 Alfa Romeo Racing 2019 F1 car shakedown in Fiorano, Kimi wore a new helmet design. The official and final season design was revealed at the Australian GP 2019. 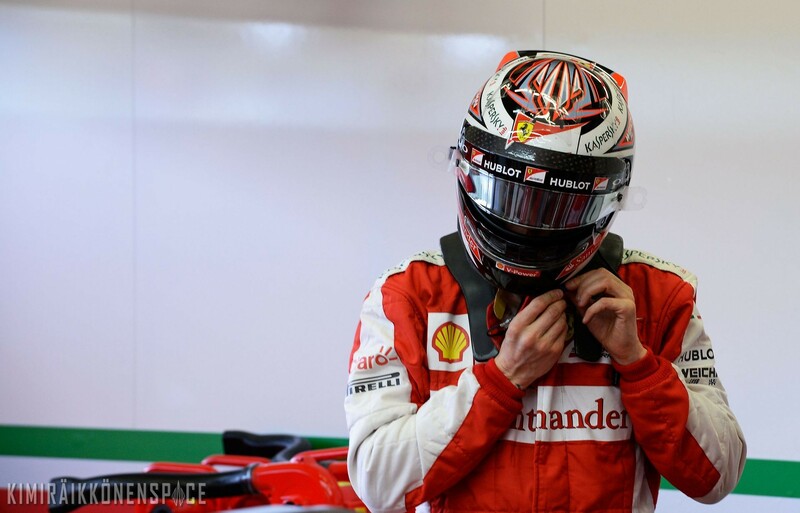 “Usually Kimi gives a hint of what should be on his helmet for the season ahead. I’ll then make five different versions of the idea with the computer and he picks what he likes the most” Uffe explains. “Sometimes it has been that whatever Kimi brings to his helmet design, it doesn’t take that much time to see the same idea in some way on somebody else’s helmet, too” says Uffe. At the 2012 Monaco Grand Prix, he showed his respect to a driver of the 1970s when he incorporated the James Hunt design and name on his helmet. “The idea was there for many years, but with McLaren and Ferrari there was no opportunity to use it. Last year it was perfect and the feedback was great too” Uffe praises. Here is a cool feature on Kimi Raikkonen’s personal helmet artist and designer Uffe Tagstrom from the latest April issue of F1Racing magazine. A nice insight into the helmet evolution of one of the most iconic racing drivers in the world. Anyway, nice and useful post. The description is correct and needs no alteration 🙂 Kimi’s helmet is black, as the black front below the visor is parallel to the back which is also black. The white chops/lines come from the top. Where can i buy some of kimi’s helmet? i prefer the latest one. thanks! No, those were just the Official Team 2013 photoshoot pics of Kimi’s helmet design, then it was announced later that he has joined Bell and they will be manufacturing his helmet this year. It’s a Schuberth helmet not Bell. All Ferrari drivers of recent times use Schuberth. He used Bell back in Lotus. No it is not Schuberth, its already explained above why. I know Ferrari use Schuberth because they are a sponsor but Kimi has chosen to remain with Bell and the pictures prove this. He uses Schuberth for only PR/Marketing events. Was the trident insignia painting in the helmet? Just wanted to congrat whoever did this webpage… its awesome! Let’s hope kimi’s season improves!